Lower back pain can be result of strain, injury, stress or repetitive movements. According to research, almost 80% of the American population is at risk of suffering from lower back pain during their lifetime. The National Institute of Neurological Disorders and Stroke holds the opinion that job-related or job-induced lower back pain is more common in relation to injuries or strains. For effective treatment, some of the best back braces can address this issue. Lower back pain can also be caused by several diseases which include herniated disc, arthritis, sciatica and infections. However, for support in your daily life, back braces are a useful tool besides proper treatment. Lower back pain can be either chronic or acute depending on reason and treatment of the problem. Using a good quality back brace is supportive for both types as it will help you regain the lost balance gradually. What does a back brace for lower back pain do? The purpose of using back braces is to minimize lower back pain and provide support to the patient. In many cases, back braces are also successful in completely eliminating lower back pain. Whether you face back problems due to injury or aging, you can get relief by using a suitable back brace. There are several benefits of using a back brace, such as providing stability after surgical procedure. It is rather difficult to find balance followed by a surgery so a back brace will help you get it back. Plus, if your daily routine involves working with the lower back, you might be familiar with back strain. In order to avoid any harm, you can use a back brace for relief. Back braces are also useful for aging adults who often complain about lower back pain. It is natural to feel weaker with age but with support you can get back your strength. Back braces are also of great support when it comes to improving poor posture. People who work for long hours in the same position or with repetitive movements involving lower back might suffer from posture problems that can also induce pain. Similarly, to maintain your posture after surgery you can get support from back braces. In short, they will help you support your body and hold it correctly to avoid any lower back pain in the future. If your work is stressful, you might be at risk of lower back injury. However, by using a brace at the earliest signs of lower back pain you can prevent any harm in future. You will be able to avoid straining in the muscles and therefore safely participate in daily activities. One thing that you should be careful about when using a back brace is not to become reliant on it. If you use it regularly for too long, your back might find it difficult to cure from the injury by relying on the support. On the other hand, a back brace can play an integral role in helping you recover from back strain, poor posture or surgery. It plays significant role eliminating and reducing lower back pain. A back brace should always be comfortable to wear. There are several back braces made from different materials and different features which you can pick based on your preference. Following are some of the best back braces for lower back pain that you can consider. Mueller Back Brace is one of the most popular back braces for lower back pain that is designed to support posture and lifting activities. Additionally, it will be helpful for people with lumbar orthosis, arthritis and other similar conditions. The unique feature about this back brace is the removable lumbar pad which does not only cushions lower back but provides compression for support and relief. Furthermore, the use of flexible steel will support your spine while the plastic component will avoid brace rolling. The adjustable straps allow custom fit for people with different waist sizes. It also has a double layer design that can be adjusted for suitable compression for the abdomen and lower back. This brace can be used by people who are trying to recover from a surgery as they need support for their back or those who want to take preventive measurements in their daily life. Moreover, it will be useful for aging adults too. After using this back brace, customers have testified that it provides them with instant relief from strains and stress. On the other hand, it has also been useful for people who perform physical activities like weight lifting, or dancing on daily basis. Besides this, it has helped many people during chronic lower back pain too. One of the best quality back braces is the BraceUP back brace which is a unique brace that provides support to people with chronic and acute lower back pain. It features dual adjustment straps which offer comfortable and customized fit for various waist sizes. Moreover, it includes mesh panels which perform the task of releasing heat and moisture and block out any odor. This back brace has design which resists slipping or bunching thus providing maximum support. It is made from breathable material that will not suffocate your body while you are wearing it. BraceUP Back Brace can be used by aging adults or seniors who often complain about lower back pain. It will also be helpful post-surgery recovery as it will give support to spine and lower back. In addition, it can be worn to prevent injuries during tasks that require repetitive movement of the lower back or abdominal area. After using it, customers have reviewed this back brace as a useful and heavy duty brace. People with transverse myelitis have also used it for noticeable difference in their lower back pain. This is one of the most popular back braces for lower back pain because it is specially designed for recovery from surgery or injuries. The Copper Compression Back Brace includes copper content that provides support to waist along with proper grip. It will accommodate waist size of up to 39 inches and can be worn by men and women. With its compression feature, this brace will reduce stiffness and soreness in muscles that caused due to overworking the body. Similarly, post injury or post-surgery body needs stabilization before it is able to move independently. In such cases, the brace will provide that comforting support to lower back as well as abdominal area. This back brace with compression can also used by people with tendonitis, lumbar pain, and sciatica. It will provide a maximum amount of soothing compression to muscles allowing your body to mobilize without restraints. It has become a favorite back brace for senior customers who have aging bodies that need regular support for daily routine. This back brace has also been used by people with herniated discs who claim that it helped them recover from chronic lower back pain. Some customers also like to wear it daily for training as it helps them maintain their posture as well as avoid injuries during activity. The AidBrace Back Brace can also be considered one of the best high quality back braces since it has been made with authenticity to help people in recovering from acute and chronic lower back pain. This back brace concentrates on bringing back the mobility and movement in your life. It is made from breathable vented mesh which will allow the air to move freely without causing sweating or odor. In addition, it has an adjustable cushion lumbar pad which you can use if you need extra compression while wearing the brace. Another special feature is the curved sides which add more shape to the brace as well as provide maximum amount of support to your body. Additionally, this brace is the most useful for people who feel back strain or back stress after daily activities that might demand movement of the lower back. It will not only increase your mobility but also correct your posture. This brace has been used by many customers who had positive experiences. Many people claim that it helped them recover from sciatica as well. It has also been used post-surgery with satisfactory results afterwards. Moreover, people who participate in straining activities regularly use this back brace as a preventive tool. ComfyMed Back Brace can be listed among the best rated back braces since it is specially designed keeping in view all the needs of people with lower back pain. This back brace focuses on providing lower back support without restricting the movement of your body. You will be able to lean, move and tilt freely while wearing this back brace. Moreover, there is a lumbar pad included in this back brace which can be removed if you feel uncomfortable. However, the goal is to provide extra compression to lumbar area in the body. Similarly, it is made from soft material which does not feel rough or hard. The ComfyMed Back Brace is useful for people with sciatica, muscle spasms, osteoporosis, scoliosis and other medical conditions that can cause chronic or acute lower back pain. Furthermore, it will help in maintaining posture post-surgery and injury while simultaneously reducing pain in abdominal and lower back area. After using it, many customers have claimed that they were satisfied with its results as it helped them recover and stabilize after dealing with lower back pain for years. The compression from lumbar pad has also been useful for seniors who had lower back pain or abdominal pain which restricted their movement. Another one to be ranked among best back braces for lower back pain is the Sparthos Back Brace. It is made to relieve chronic back pain after injuries or surgery. It provides immediate relief with the help of compression for lower back and abdominal areas. In addition, it comes with a removable lumbar pad which you can use for compression and take out when you feel uncomfortable. The brace is made from flexible mesh material which will easily fit different sizes and provide proper grip without slip during movement. The breathable material also allows for air to move freely and avoid sweating on the body. People with several back problems like arthritis, sciatica or osteoporosis can benefit from using this back brace that will help them recover. Moreover, it will also provide stabilization after a surgery so your body can support itself. 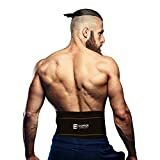 Among other things, people who are involved in training or workout on regular basis can wear this back brace so they can avoid straining of muscles. Many customers who used the Sparthos Back Brace felt relieved from acute and chronic pain. Similarly, it helped in keeping spine aligned and thus reducing lower back pain for some as well. It has also become a favorite because it is lightweight and easy to wear in daily routine. This list of best back braces for lower back pain is quite useful in figuring out different braces and their features which set them apart. A back brace does not only reduce the pain but also increases your movement and help you get back on track. Moreover, back brace can also improve the quality of your life by helping you recover from disease that target back pain due to injury, poor posture or excessive stress on the lower back.